It would seem, why chainsaw cottagers whoengaged in the cultivation of fruits and vegetables, or the owner of a country house having a small garden and a few flower beds? The question is no longer when there is a desire to build a bathhouse, update greenhouse knock down old business, or just make the bench for the rest. 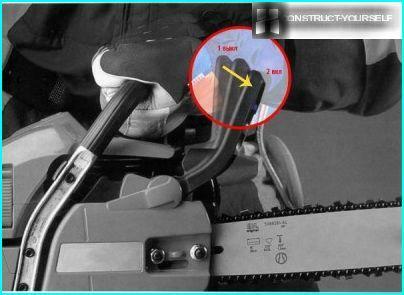 Unfortunately, any mechanism periodically need in the prevention and change of parts, and for this we need a good understanding of the product device to the same chainsaw repair their own hands to save time and money. 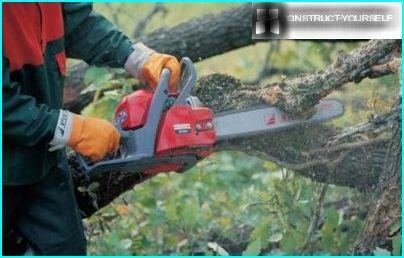 All chainsaws are similar in structure,regardless of whether they are European production (ECHO, Stihl, Husqvarna) or domestic (cedar, Ural). Inside the case are the basic elements - the fuel tank and the engine, and outside starter handle, the saw of the (bus) with the chain. A sharp tug rope starts the engine, and that - the saw blade. Most of the problems associated with outages orengine operation (fuel supply system, exhaust system, ignition, cylinder-piston part), or other failures of systems and components (clutch, chain brake, tire, oil system). 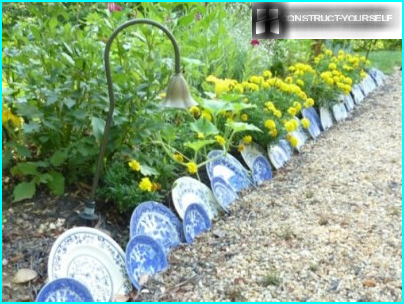 Consider the most common faults and methods of their elimination. The first thing to do in case of breakage chainsaws, - inspect the spark plug wire is disconnected, and gently removing it with a special key. Dry. Most likely, not in the cylinder fuel mixture gets. 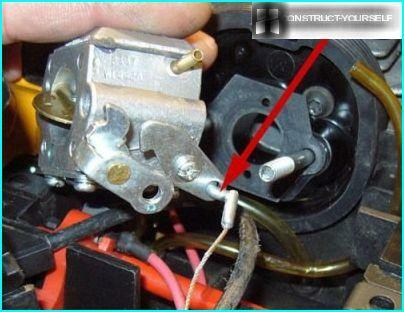 It is not in the ignition system, so the candle back spin. Heavily splashed fuel. 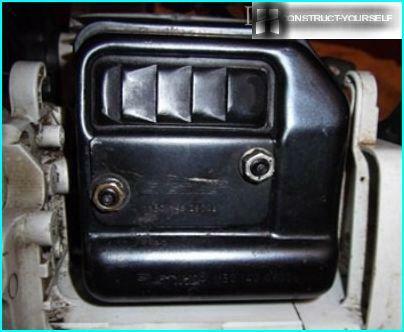 The reason for the excess fuel mixture is covered eitherrun rules violation, or maladjustment carburetor. Candle carefully wiped, shut off the fuel and include a starter - in order to remove excess fuel and ventilate the combustion chamber. Then place the candle in place and again trigger mechanism. Covered with black soot. This may indicate that the application ofpoor-quality oil, for improperly adjusted carburetor or incorrectly calculated the ratio of gasoline and oil. The candle should be washed, cleaned of soot with a sharp object (awl or needle), wipe cloth and place the electrodes in place. 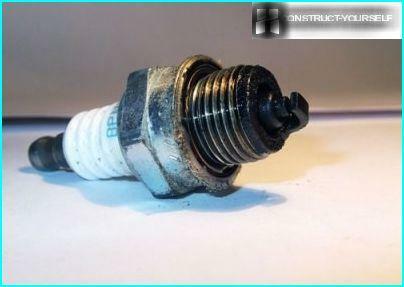 Check the spark plug, it is necessary to pay attention to the gap between the electrodes: normal is 0.5 to 0.65 mm. Worn or damaged gasket must be replaced. To be sure, check andthere is a spark. 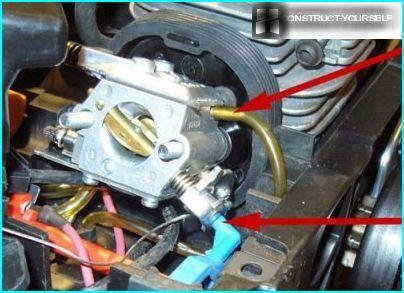 To do this, put the spark plug cable, connect the pliers and nut candle cylinder, give birth to a starter and watch the sparks. If it does not - you need to replace a candle. If a new candle does not generate sparks - the problem is the high-voltage wire, or in violation of a compound with a candle. the fuel filter is clogged. 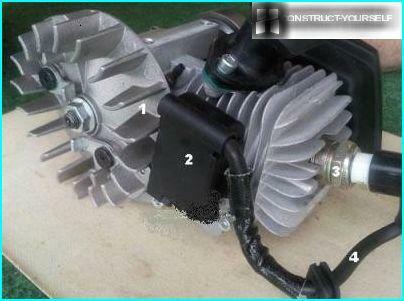 It is necessary to remove the fuel hose and check howflowing fuel. If the stream is weak, you may need to clean the filter. Get it through the filler opening of the fuel tank and clean, in the case of heavy soiling replace the new one. As a precaution recommended to replace the fuel filter every three months. Clogged breather (A hole in the tank lid). Disconnecting the hose also checked in the case of clogging purified by needles. The absence or insufficient quantity of fuel. The reasons for failure can be several. The first reason - the air filter is clogged. The air flow into the carburetor stops in the desired amount in this regard due to the operation of the engine is disturbed too rich fuel mixture. The contaminated filter gently removed, cleaned and washed with water, dried and then put into place. Another reason - the wrong Alignment Operation carburetor. The adjustment is made with three screws. During operation, it is necessary to use the manual, otherwise you may make it worse. 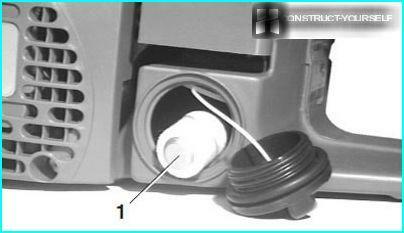 And the last reason - violation of membrane integrity or clogged carburetor channels. All parts must be clean, dry and serviceable. If at low revs the engine is working fine, and at large begins to stall, the reason may lie in the spark arrester muffler clogged combustion. Dry cleaning is not allowed, as in the present nagare carcinogens, inhalation of which is dangerous to health. After removing the muffler outlet opening is closed with a clean cloth. To avoid clogging of the silencer happened,necessary to monitor the composition of the fuel mixture. The amount of oil should not exceed the standards recommended by the manufacturer. 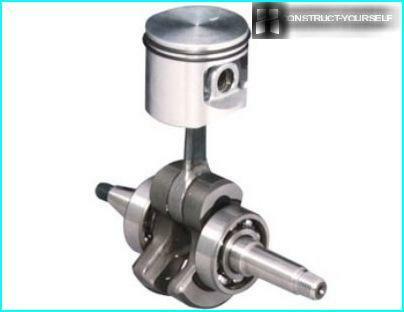 Poor oil quality is also adversely affect the operation of the engine. 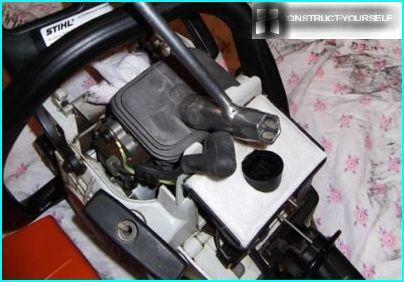 Often the engine does not start or does not work infull force due to low pressure in the cylinder. It may be caused by wear of the piston or cylinder, sticking of piston rings, bearings wear. Partially consider the condition of the cylinder-piston group (CPG) is possible by removing the muffler and looking into the opened hole. Compression placed in the spark plug hole,It helps to make metering of compression in the engine - as a result of the measurement may also be able to talk about the CPG. Accurate data is obtained only after a complete disassembly of the mechanism. If the piston has chipped or scratched, it should be replaced. The piston ring must be clean, without fouling, and be exactly in place. Leaking oil. 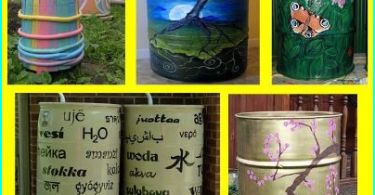 It is checked whether the tube is hermetically connected to the pump fittings and whether cracks on them. Problematic tube sealed with sealant or change. Inadequate oil flow. Most likely crammed lubrication channels. 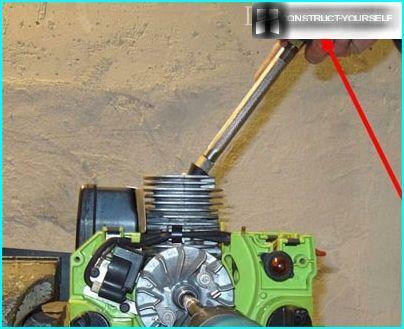 The occurrence of cracks on the oil pump housing. The replacement of parts. 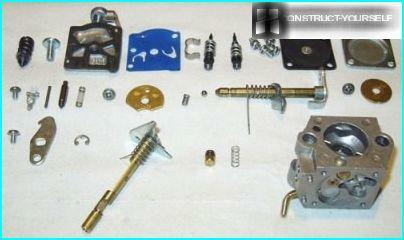 The chain brake often does not work becauseclogging grease or sawdust brake band and the space under the hood. It is clear from all of the blockages. The tape might have simply worn out, then it must be replaced. Some parts wear out faster than a chainsaw,than others. These include the drive sprocket, tire, chain, anti-vibration elements. For quick replacement parts is always better to have on hand. Do not neglect and sharpening chain.